Recognizing the different forms of acne and pimples is your first step in understanding the cause and treatment of your particular type. Acne is sometimes called “common acne” because most of the people suffer from a pimple outbreak at some point in their life. Human skin, particularly on the face, neck, back, and chest is covered with hundreds of thousands of microscopic hair follicles, also called pores. For reasons that no one fully comprehends, these follicles at times overproduce cells and become plugged. Acne starts when oily secretions from the skin’s sebaceous glands (oil glands) block the tiny openings for hair follicles (plugged pores). So, the Sebum (oil) which normally drains to the surface gets trapped and bacteria begin to grow. And acne lesions begin its journey as a microcomedone. Although, most people with acne are aged between 12 and 25 but sometimes older and younger people also suffer. 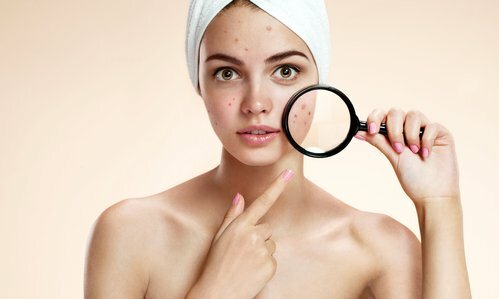 Acne usually sets off during puberty between the ages of 10 and 13 and is likely to be worse in people with oily skin. Whereas it occurs in both sexes, but teenage boys are generally more affected than girls. Teenage acne generally lasts for 5 to 10 years, and usually sets right during the early 20s. Nearly 8 in 10 teenagers suffer some degree of acne. Usually it is mild. However, it is believed that about 3 in 10 teenagers have acne severe enough to require treatment to avert scarring. On the other hand women are more likely than men to suffer mild to moderate forms into their 30s and beyond. Acne generally occurs on the face but can develop on the back, neck, chest, shoulders, and upper arms too. The intensity can vary from mild to severe. Untreated acne commonly last about 4-5 years before going away. However, it can last for many years in some cases. Whitehead: If the openings are small, the clogs take the form of whiteheads: small, flesh-colored bumps. In this case, the trapped sebum and bacteria remain below the skin surface, and a whitehead is developed. Whiteheads may appear as tiny white spots or they may be so small that they remain invisible to the naked eye. Blackhead:If the openings are large, the clogs take the form of blackheads: small, flat spots with dark centers. A blackhead develops when the pore opens to the skin surface and the sebum that contains the skin pigment melanin, oxidizes and turns into brown/black color. Remember, it is not dirt and cannot be washed out. Blackheads can last for a long time as the insides very slowly excrete to the skin surface. Both types of non-inflammatory acne, blackhead or whitehead, can discharge its contents to the skin surface and heal or the follicle wall can rip open and inflammatory acne can arise. This rupture can be due to random incidence or happen because of picking or touching the skin. This is why it is pertinent to leave acne prone skin rather untouched. A papule develops if there is a fissure in the follicular wall. White blood cells barge in and the pore gets inflamed. Sometimes a grave inflammatory reaction can lead to very large pus filled lesions. When a follicle ruptures along the bottom, total collapse can ensue, resulting into a large, inflamed bump that can be painful to the touch.